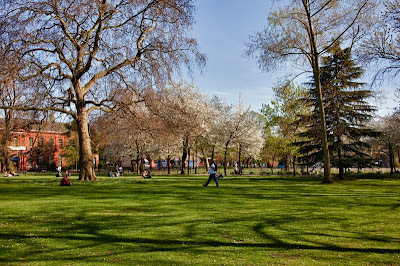 London's parks are looking magnificent at present with all the blossom appearing. Follow other skies around the world today. Looks like a gorgeous day. Our blossoms are disappearing as yours begin. Look at that gorgeous green grass!!! Oh so beautiful! That scene sure beats the gray and wet outside my window. Hope you get some sunny days to enjoy the parks! Cherry Tree's are the highlight of Spring for me, such a beautiful sight. Quite a few of the trees near me have already lost their blossom. The air looks so clear and fresh! Nice spring shot.